Difference between revisions of "Willow Numbered Road System"
W-2 was a short freeway that serves Willowridge district. It will extend to [[A92]] north of borealia, but there is no access to [[Borealia]]. New border changes between Willow and Borealia significantly reduced W-2's exits and purpose. '''Since February 2019, Willowridge has been completely cut from Willow after border changes with Borealia. This cuts off W-2's importance as a vital connection northwards and to A92 and all buildings must be destroyed to keep Borealia's satisfaction. W-2 has now been decommissioned and only one exit will remain: the Avenue Rd Exit before entering a tunnel to bypass Borealia. '''It will be proposed at GSM with as a B-Road, but only until the buildings have been moved or removed. 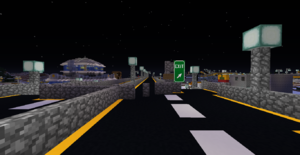 | 2 || Avenue Rd || The interchange was redesigned three times. | 3 || W-1 || W-2 originally ended here. The Willow Numbered Road System is a system of roads designated a number for their importance in the towns of Willow, Charlemagne and one in Savage City. There are currently 5 main roads and 2 auxiliary roads. These roads range from rural 2 lane roads to wide 4 lane expressways. This road was the first road in Willow, starting from T48 in the unrealistic district to the border in Twilight. It is an arterial road with only one interchange with W-2 and has no plans to incorporate interchanges along its route. W-2 was a short freeway that serves Willowridge district. It will extend to A92 north of borealia, but there is no access to Borealia. New border changes between Willow and Borealia significantly reduced W-2's exits and purpose. Since February 2019, Willowridge has been completely cut from Willow after border changes with Borealia. This cuts off W-2's importance as a vital connection northwards and to A92 and all buildings must be destroyed to keep Borealia's satisfaction. W-2 has now been decommissioned and only one exit will remain: the Avenue Rd Exit before entering a tunnel to bypass Borealia. It will be proposed at GSM with as a B-Road, but only until the buildings have been moved or removed. 2 Avenue Rd The interchange was redesigned three times. 3 W-1 W-2 originally ended here. Ice Lake Dr is an arterial road inside Willow but expands to an expressway with at-grade intersections near Charlemagne. It is a rural highway and will undergo work to try and direct more traffic to it. It has also undergone multiple "realism" projects to upgrade it to standards. 2 Main St Willow Originally to be a high occupancy arterial, but construction is mainly focused on Midnight District now. W-5 is a freeway meant to skip through the districts in Willow and bypass W-1. Most of the interchanges are grade-separated, and this highway passes through the largest interchange in Willow and Charlemagne. It also passes through the most districts in Willow. Services Dr is an arterial in Willow's Realistic district that is parallel to W-1. It does not have the W-1A designation until Dark Skies Blvd, but there are ramps at Nebula Dr because of the way it intersects with the road. It originally was to be the extension of W-1, but W-1 was already built across the Frozen River Bridge to Twilight. The section within Charlemagne is named Charlemagne Highway although it is not one. It features only 2 intersections due to th hilly mega taiga biome. W-3 will have a customs gate at the Savage Drop Tunnel, but planning is undergoing. W-4 is the first road to be completely inside of Charlemagne. Its speed limit is 110 km/h for it’s fairly straight path. It serves Starry District in Charlemagne and the Admod sub district. The highway can be twinned to become a freeway, but current interchanges would have to be rebuilt.